Portrait For A Cause - All Chucked Up! I recently got wind through good friend, Ronnie Henares, about an awesome goodwill and charity event happening tomorrow to help our fellow kababayans who were severely affected by the recent flooding. 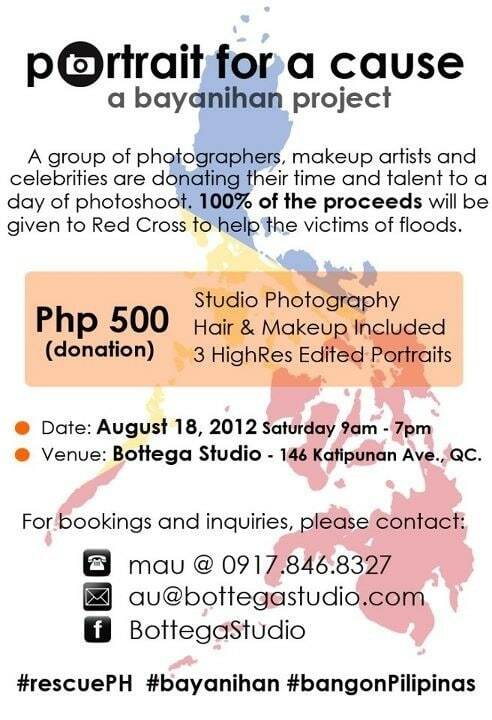 Bottega Studio by L.A. based photographer and stylist (husband and wife tandem), Mau and Au Mauricio, together with a group of photographers, makeup artists and celebrities will do your portrait shots for a minimum donation of Php 500.00 only. This wonderul cause happens tomorrow – Aug18, from 9am to 7pm at 146 Katipunan Ave., Whiteplains. Landmark is Dexter Bakeshop and BDO. This is a wonderful way to help out those greatly needing relief and provisions. So, please spread the word and let’s get tons of people over to have their portraits taken. For additional details or to have yourself scheduled, you may reach Au Mauricio through cell number 09178468328. Just inform them that you got their number from Ronnie Henares.